The Bicentennial ended with the re-enactment of Yorktown in September 1981. Some of our members felt their "tour of duty" with the Town had ended. Others, including the many high school youngsters who had enthusiastically joined our ranks, pursued new interests or graduated and went to college. Soon, the best we could do was to put four or five men on the street for a parade. To meet this challenge, we re-wrote our bylaws, including a new mission statement, based on our perception of a local, state, and national need for an organization like ours. Our Mission: To research and interpret Glover's Marblehead Regiment and its 18th century culture, for the purposes of inspiration and education. During the mid-1980s and early 1990s, we broadened the scope of our historical interpretation to include 18th century culture and to embrace the equal involvement and partnership with women and with children. 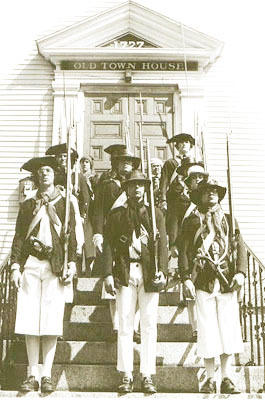 Today, Glover's Marblehead Regiment is both regional in scope and a leading member of the Continental Line - a distinguished society of historical interpretation groups that seeks to promote large events with historical accuracy and safety. Our membership in the Continental Line has brought us increased regional and national recognition as we continue to respond to a growing national need for educating and inspiring Americans by immersing them in a living reminder of our national heritage.